Rockwell Jawstand RK9033 vs RK9034 XP: Which One's Best? Rockwell Jawstand RK9033 vs RK9034 XP: Which One’s Best? We need to clear one thing up at the beginning, Jawstand is not some new Olympic gymnastics move, although it might be an interesting one to watch. 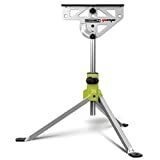 The Rockwell Jawstand is a floor-standing clamping accessory engineered to give users the use of both hands when working on large and awkward types of stock. Being a fan of how companies use model numbers to differentiate their products, the “XP” for the RK9034 model suggests it being the “extreme performance” model in the line. I wonder? Well, there is no better way to find out than to keep reading. Just what is the Jawstand, plain or XP flavor? It is tempting to apply the terminology, “third hand,” but describing the tool as “two extra” hands is more accurate. The Jawstand is designed to hold materials that are either too awkward to hold and work on, too heavy or a combination of both. They have clamping jaws to hold material securely and offer adjustability in both height and angle, between horizontal and vertical. The Jawstands also are useful for supporting oversize stock while running it through other power tools like table saws and chop/bevel saws. Given the modest price difference and the nice additional features of the XP, users are well advised to purchase it over its less capable, plainer cousin, Jawstand. We always find a little friendly competition between tool choices is a fitting way to find the best overall performer. Sometimes it’s a tie. Sometimes its too close to matter from a potential buyer’s perspective, and other times, there are clear winners. Time to see where the competition falls out between the Jawstand and its rival, the Jawstand XP. Both contenders support a maximum of 220 pounds and clamp material up to 1-3/4” thick. It’s a horse apiece. Both offer the ability to move material up and down and adjust the angle of the material relative to the horizontal plane of the floor. The XP earns the point here for a couple of reasons. It can hold material at a maximum height of 43” versus 41” for its rival. And, the XP offers the ability to precisely adjust the material’s height between 0 – 2” under load, something the RK9033 cannot do. Yes, this is a highly subjective category. We happen to think the XP with its black anodized head and legs look better than the plain silver of the Jawstand. Unless a buyer finds the RK9033 for a “steal of a deal,” the RK9034 is a better choice, hands down. A touch more height capacity coupled with better, easier to use controls for a fraction more money makes the XP the champ. Not to mention it is better looking. How about a short and sweet recap of both tool’s good and bad qualities? The Jawstand is not without its good features. Let’s give them equal time, shall we? Time for the results of user research to see how these perform in the wild. Overall, both receive excellent marks even with a few nagging issues Rockwell should consider addressing in future variants of this tool. Users especially appreciate these tools when working with other power tools, especially for holding stock parallel to the floor. Many users report using them purely as outfeed tables. They especially appreciate the precision vertical adjustment of the XP when they have tools with different height work surfaces. Both the RK9033 and RK9034 receive good marks for the quality of the build. Take this with a grain of salt though, Rockwell uses lighter metals for some components that can be easily damaged if forced. When users report issues, the clamp takes top honors or dishonors in this case. Users complain that the clamping surface is too small and with having difficulty getting the clamping knobs tight enough to hold stock securely. Out of the box, users are reporting both tools as stiff and difficult to adjust. It seems they require a break-in period. After this, users report them being much easier to use and adjust. While negative reviewers tend to agree with the benefits of the tool as an outfeed table, they report finding that stock does not slide easily, suggesting the addition of rollers to remedy the issue. One last issue is worth mentioning. Fully extended, the legs take up a lot of room, important for stability when handling heavy, awkward material. For users with a small shop, this might be a problem. If you recall earlier in the review where we said, “We don’t always find a clear winner?” Well, this isn’t one of those occasions. The Jawstand XP is the winner in this competition without question. It is a better value for the money considering all things. If you go to the store to buy one and the RK9033 is all that’s left, should you buy it? That depends on how soon you need it. It is a very serviceable tool and will serve you well in its intended role. Saying that, if you can wait for the XP, it will be worth it. Any user who needs to support heavy, awkward material while they work it into shape or who need support for large stock, either on the infeed or runout side of their power tools, will find the Jawstand XP a great addition to their shop.